The ability to apply software to strategic advantage is the de?ning technology theme of this decade. This is not just an IT issue. It is a business imperative. Every business is in the software business. In some industries, the number of software jobs has doubled over the past ?ve years. JP Morgan Chase has more software developers than Google and more technologists than Microsoft. If you think your company isn’t in the software business, you’re wrong. Airlines, oil companies, telecommunications providers all are using applications to attract customers and gain a competitive advantage. With the ubiquitous adoption of mobile devices, a whole new platform for application and content delivery is evolving. With their colorful, interactive, intuitive user interfaces, always-on global connectivity, sensing capabilities such as GPS and device orientation and their ability to connect with users through personalized con?guration options, mobile is truly the de?ning platform of the application economy. Accordingly, the ability to fully embrace the mobile platform and integrate it into the organization’s technology fabric is a key strategic requirement for enterprises today. 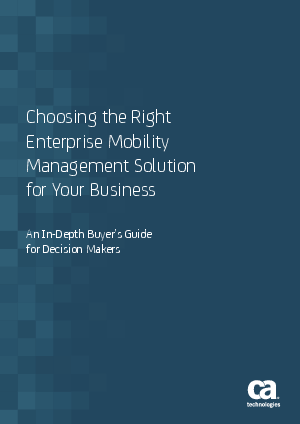 Enterprise Mobility Management (EMM) is the solution to manage this integration successfully.